This is part 2 of enchiladas on dishgracepoint. 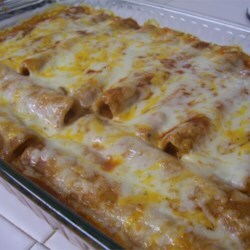 I recently posted beef enchiladas. They look good, but I think this recipe should save a little more time. It's very similar, but with chicken as the filling. Labor Intensity: 3-4 extra people should really help. 30 servings, adjust by 1.5x if your group tends to eat multiple servings. Cut chicken into 1/2 - 1 inch cubes. Heat some oil in a large skillet. Add garlic and fry with chicken. Wrap corn tortillas in a wet paper towel and heat for 30 seconds (this is so the tortilla is soft) in the microwave. Roll it up, so it looks like a mini burrito. Place in a baking tray and cover with "enchilada" sauce--I always like to use chile verde, but there are also chili rojo and others. Bake in oven at 350 for 25-30 minutes and you're done! Not much else to add here. I think you can use flour tortillas as well, but not sure. Serving size is 2 tortilla's worth per person. Depending on side dishes and how hungry the audience is, I would adjust the quanitity as needed. I would even suggest shredding 1 head of lettuce and adding it to the tortilla for texture. this is one of my favorites!!! !